Sarita V. Adve is the Richard T. Cheng Professor of Computer Science at the University of Illinois at Urbana-Champaign. Her primary research interest is at the hardware-software interface with work spanning computer architecture, programming languages, operating systems, and applications. Her current research is on scalable system specialization and approximate computing. She co-developed the memory consistency models for the C++ and Java programming languages, which are based on her early work on data-race-free (DRF) models. More recently, her work questioned the conventional wisdom for memory models for heterogeneous systems and showed that DRF is a superior model even for such systems. She is also known for her contributions to cache coherence (she co-developed the simple and efficient DeNovo coherence protocol); hardware reliability (she co-developed software-driven approaches for hardware reliability in the SWAT project and the concept of lifetime reliability aware architectures and dynamic reliability management in the RAMP project); power management (she led the design of GRACE, one of the first systems to implement cross-layer energy management); exploiting instruction-level parallelism (ILP) for memory system performance (she co-authored some of the first papers on exploiting ILP for memory level parallelism); and evaluation techniques for shared-memory multiprocessors with ILP processors (she led the development of the RSIM architecture simulator). Professor Adve received the ACM/IEEE-CS Ken Kennedy award in 2018, was named a Woman of Vision in innovation by the Anita Borg Institute for Women in Technology in 2012, an IEEE fellow in 2012, an ACM fellow in 2010, received the ACM SIGARCH Maurice Wilkes award in 2008, an IBM faculty award in 2005, was named a UIUC University Scholar in 2004, received an Alfred P. Sloan Research Fellowship in 1998, an IBM University Partnership award in 1997 and 1998, and a National Science Foundation CAREER award in 1995. For three of the last five years (2014-18), Illinois CS has selected her students' PhD theses as one of the department's two nominations for the ACM doctoral dissertation award. She currently serves as the chair of ACM SIGARCH, on the DARPA/ISAT study group, and on ACM Council. She previously served on the board of directors of the Computing Research Association (CRA) (2009-18), on the National Science Foundation's CISE directorate's advisory committee (2003-05), on the expert group to revise the Java memory model (2001-05), and co-led the Intel/Microsoft funded Universal Parallel Computing Research Center (UPCRC) at Illinois as its director of research in its founding year (2008-09). 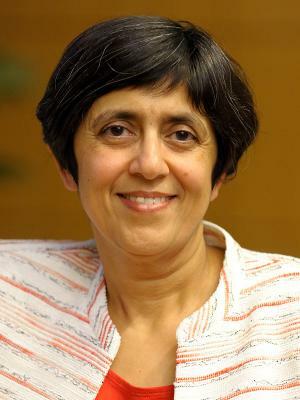 Professor Adve was the first woman of South Asian origin to be named fellow of the ACM and, as a Maurice Wilkes awardee, the first woman to receive a young-, mid-, or life-career award in computer architecture research. She is deeply committed to increasing the number of women in computing by influencing change that can enable more women to be successful at all stages of the career pipeline. She received the Ph.D. and M.S. degrees in Computer Science from the University of Wisconsin - Madison in 1993 and 1989 respectively, and the B.Tech. degree in Electrical Engineering from the Indian Institute of Technology - Bombay in 1987. Before joining Illinois, she was on the faculty at Rice University from 1993 to 1999.